Most dreams take focus, sweat and a lot of hard work. Other dreams include hot, fresh Quesaritos and Chalupas delivered fast, right to the front door. Taco Bell fans have been wishing for delivery for years and now it’s coming true. On February 7, Taco Bell announced US-wide delivery available via Grubhub, uniquely designed for an even faster experience. And for a limited time, all Taco Bell orders over $12.00 come with free delivery excluding tax. To ensure faster delivery, Taco Bell has integrated its point-of-sale system directly into the Grubhub app, which means pickup is timed to the moment an order is ready, helping precious cargo like Bean Burritos and Crunchwrap Supremes make it to the doorstep hot, fresh and Fire Sauce-ready. 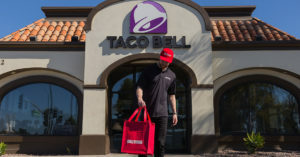 When there’s a taco craving, there’s a need for Taco Bell delivery, so Grubhub is also bringing more drivers to areas with Taco Bell restaurants so more fans can stay in, stay warm, stay fed and live más. Fans looking to enjoy their favourite menu items at home can jump onto tacobell.com and plug in their zip code before being directed to Grubhub, or go directly to Grubhub.com or the Grubhub app to place their order at the nearest restaurant with delivery available. A U.S. partnership between Yum! Brands and Grubhub was announced in 2018, to accelerate online ordering for pickup and delivery. 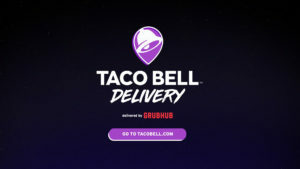 The unique partnership continues to flourish as Taco Bell expands its nationwide footprint and Grubhub enters new markets, giving fans access to their favourite food items and delivering them straight to their door. 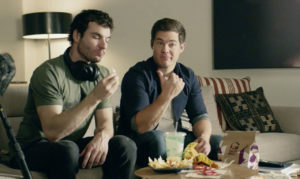 The joy of having taco dreams come true is celebrated in a new national Taco Bell advertising campaign that stars actor Adam DeVine. The :15, :30 and :60 commercials by Deutsch Inc., show that while some dreams take determination and patience, other dreams are simpler and can come right to your door – like Taco Bell via Grubhub delivery.